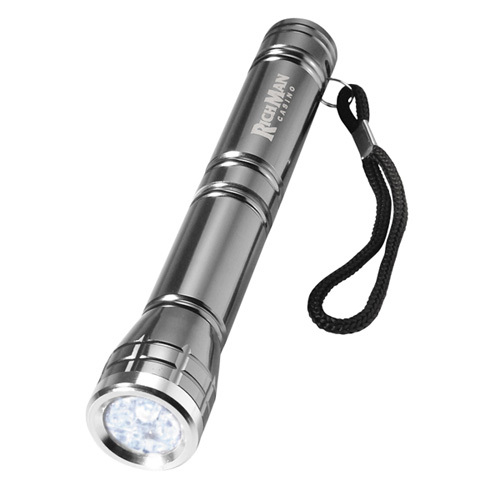 Shine the light on any business, project or event with this sleek 5 3/4" long flashlight Luminoso - Large Flashlight. Featuring five LED light bulbs and a sleek metal finish, this handy tool is perfect for emergencies, finding items in small, dark spaces, and is easy to store! Additional features include optional laser imprinting on a 1/4" x 1" area to fully customize this product to fit your organization's needs. 5 3/4 " x 1 "
Bulk / 47 lbs / 200 pcs. Imprint Area: 1/4" x 1"